What we have witnessed over the past month in London, Ontario is largely unprecedented and very troubling. After announcing record profits, Caterpillar locked out employees on New Year’s Day. The reason an agreement with this corporation could not be reached is simple; workers were unwilling to accept a decrease in wages of over 50 per cent in some cases, along with unpalatable cuts to pensions and benefits. After receiving five million dollars in tax breaks from the federal government, and locking out employees for a month, Caterpillar has relocated their operations from London to Indiana, a state which has recently passed “right to work” legislation. My purpose is not to point fingers, or explore in minute detail the reasons why each side has reacted to this situation as they have. Instead, I want to delve into what we can do now. What are the next steps for everyone involved? Sadly, the 450 or more London workers have been left in a precarious position; they will need to face limited choices in a declining manufacturing sector, while the question of severance pay has yet to be settled. This will undoubtedly have a devastating impact on the lives of many involved. Can we pay our mortgages, contribute to our children’s educations, or continue to put food on the table? These are questions most of us never want to have to ask. What about Caterpillar? Reaping some of the largest profits in their long history, they seem to be in fine shape. Poised to continue growing astronomical profits with new “right to work” legislation in Indiana along with high unemployment, they should transition well enough, no longer having to worry about decent wages interfering with their profit margin. What now for our government? 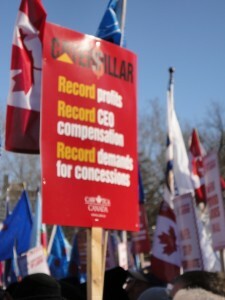 After providing financial incentives for Caterpillar to create jobs and spend money in Canada, and enjoying all of the requisite photo-ops during his campaign, Prime Minister Harper claims this is a provincial issue. After receiving this political hot-potato, Ontario’s Premier McGuinty was largely silent, offering both sides mediation if they returned to the table. Neither of these were particularly effective strategies, if the goal was to keep/create jobs and money in Canada. So what can our government do? In the past, government has been persuaded to act in the interests of workers affected by plant closures. Steven High’s Industrial Sunset explores this process, illustrating how workers’ appeal to a national community in Canada alleviated some of the worst effects of job loss. This encouraged legislation that protected workers’ against some of the worst effects of plant shutdowns through amendments to the Ontario Employment Standards Act and the Canada Labour Code, which required advance notice of mass terminations and provided for mandatory severance pay. Amendments to the Employment Standards Act in 1980 further encourage the portability of pensions, compelled employers to participate in adjustment committees, and mandated corporations to pay their employees benefits throughout the pre-notification period. The Conservatives under Brian Mulroney dismantled the Foreign Investment Review Agency (FIRA), replacing it with the Investment Canada Act, and gave it the mission of attracting foreign investment. An important caveat to this process is that there must be a “net benefit to Canada” when ownership is transferred to a foreign corporation. This has largely been ignored by both corporations and our government in the many transactions since this act’s inception. Specifically, this has been successfully imposed twice in our history, once with the sale of PotashCorp. and once with SPAR Aerospace Ltd. Both interventions were successfully spearheaded by entities outside our ruling government. Perhaps more importantly, both were speculated to be considerable threats to our national security. Why is our government so hesitant to prevent such liabilities? I would like to see our government send a message to corporations that this kind of behaviour is unacceptable. They can freeze Caterpillar’s Canadian assets a la Danny Williams with Abitibi Bowater. They can also impose heavy tariffs on Caterpillar’s exports to Canada. Also, our government needs to put an end to no-strings attached tax breaks that clearly are not to the benefit of society. Furthermore, lets ensure that terminated workers have access to re-training programs. Why not enact legislation to outlaw such destructive corporate behaviour? Government (in)action to date has done nothing but encourage the devaluation of people’s labour. What can we do? We can continue to resist this corporate push for this great race to the bottom of wages and living standards. We must stand in solidarity with these workers. After all, any one of us may be the next to receive this unfair treatment. Organized workers in the manufacturing sector led the way in pushing up real wages and living standards across a wide range of occupational categories in Canada. If we can rise together, so too can we all fall down. Finally, we can exercise our rights as consumers and boycott products produced by Caterpillar. There are many options out there for people interested in purchasing products that are ethically made. Let this be our collective stand. Ryan Kelly teaches computer science at Donald A. Wilson Secondary School; he is Vice President of District 13 of the Ontario Secondary School Teachers Federation, Chair of its political action committee, and is a member of the OSSTF political action committee.